From Park Blvd, turn onto Pinto Basin Road. Follow the road south until you reach the Cholla Gardens. I got to visit Joshua Tree National Park for the first time, recently. This California park contains features that make it feel as if you were somewhere in the Desert Southwest, instead of California. 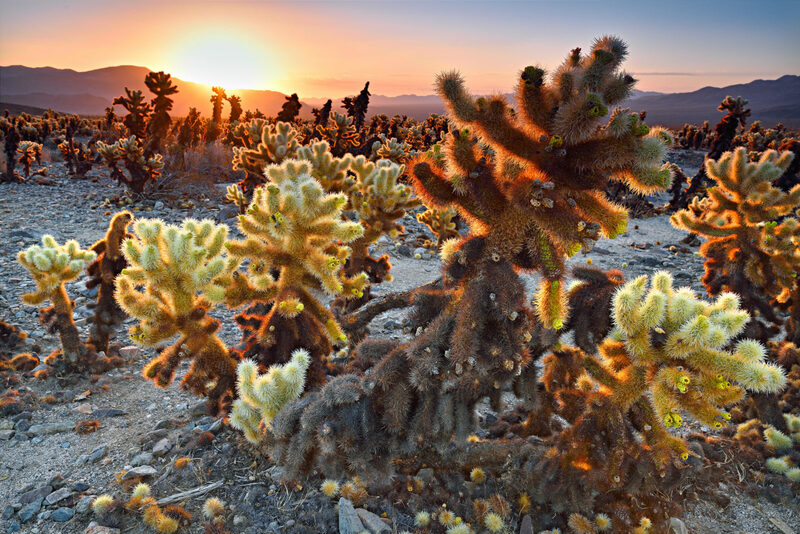 I wanted to photograph the park's Cholla Cactus Garden at sunrise, so I could set up to shoot facing east; however pathways through the gardens lead to many photo ops that can be photographed equally as well at sunrise and sunset. While I wanted to include the rising sun and show some of the surrounding terrain, I envisioned the cactus being the main focus of this shot, hoping that front lighting from the rising sun would illuminate the foreground and enhance the cactus garden's interesting textures and colors.